Good morning. We are back from our three day weekend of BBQ's and weekend adventures. After a long winter in the Northwest, those of us working in Seattle finally enjoyed a weekend filled with sunshine and we sure are thankful. I hope the memorial day weekend was an opportunity for you to spend time with friends and family. Memorial day is also a day of remembrance here in the USA. In our family at least, we take time to say thank you and recall. 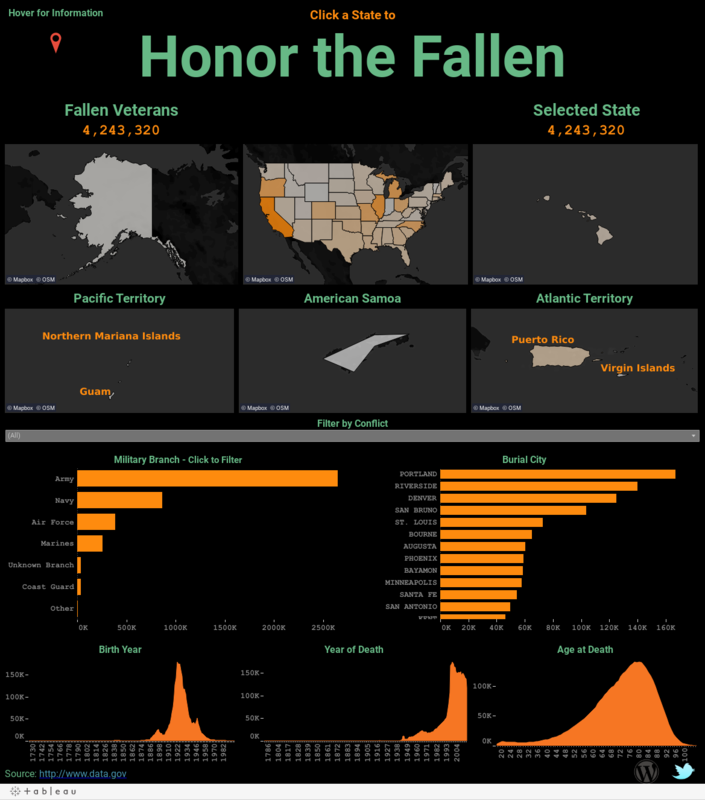 To honor Memorial day, I am sharing a blog post and visualization I found on Tableau Public designed by Sean Miller to learn more about those that have died in service to the country. As we have posted on our front page, Tableau's eLearning is now live. This is great way to help your users learn Tableau quickly and easily. Be sure to check it out. Speaking of eLearning, are you an educator teaching Tableau? Sandlin Seguin's blog post is for you: From the experts: 4 tips for teaching Tableau | Tableau Software. Tableau 10.3 is coming soon. Have you checked out all of the new features coming your way? Coming Soon is a great place to start and become familiar with the new version before it hits your desktop. Our very own Diego medrano recieved the Answer Wizard this week. This badge recognizes the achievement of 100 correct answers having been marked in the community in reply to your questions. This achievement, even for employees, is quite challenging so congratulations to Diego. Yingying Zeng asked Re: Understanding of the advanced analytics applications of BORA BERAN's is it hotspot" visualization which had several replies including Jay Morehart explaining the Script_<type> functions and how they work. Of course Bora Beran jumped in with some specifics about finding and installing TabPy. Prayson Wilfred Daniel provided details as well using Ananconda and even offered to assist in person using skype. What an amazing community of Tableau users we have. You all inspire us each day. Darrin Schulte created this idea a few years back and it is picking up increased attention and votes recently. The Idea Control what displays in View Data . Would you find this helpful? Then be sure to vote. Vathsala Achar has published a Tableau SDK in Pythont to create and publish a .tde. Ambassador Simon Runc shares some advice on how to use this great tool. Thank you Vathsala and Simon for spending your time and energy to make Tableau products work even better for your own needs.